If both vendors offer you 100% of the buttons and dials you need, then you need to expand your selection criteria. Technology requirements should be considered foundational, but factors beyond technology are also important when I&O leaders are selecting a desktop virtualization provider. According to Gartner, the maturing of platforms demands selection criteria extending beyond the purely technical and branching into account management, pricing, maintenance and support quality. 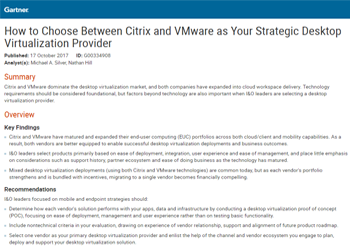 Here at VMware, we passionately believe that we continue to engineer the best virtual desktop and application delivery platform, and that we’ve made it the most capable and complete ecosystem available, but you should decide for yourself.